If you find designing and installing bathrooms for your clients daunting, then invite Walton Bathrooms to work alongside you. We can handhold you every step of the way from design and specification to supply and installation. We supply a vast range of beautiful bathroom products from the world’s best brands including Villeroy & Boch, Bisque, Keuco, Dornbracht, Hansgrohe and much more. Our own skilled craftsmen will work with your design expertise to create a beautiful bathroom, shower room, cloakroom or wet room. – Unique software to produce perfect scaled plan views and coloured 3D perspective elevations to show exactly how you want the bathroom to look. – We can brand these plans with your company name and logo with no mention of Walton Bathrooms on the designs or subsequent paperwork leaving you plenty of time to work on the rest of your assignment. – We can coordinate a team of our experts to bring it to life. – The finished bathroom will be a brilliant addition to your completed project. 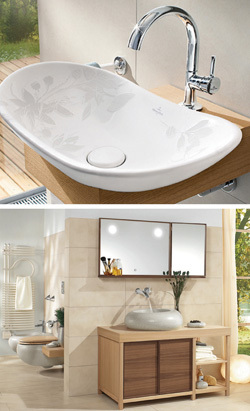 Why not visit our showrooms where we have more than 60 fantastic bathroom sets on show. Alternately, call to arrange a meeting with one of our bathroom experts to discuss how to make your life in bathroom design and installation a whole lot easier.